Open Internet Explorer and then go to the site https://join.me from here you can see the Join Me page. 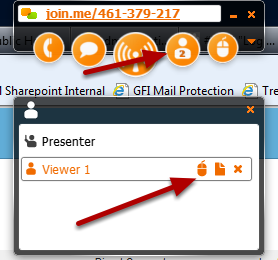 Click on the basic option in the share section. 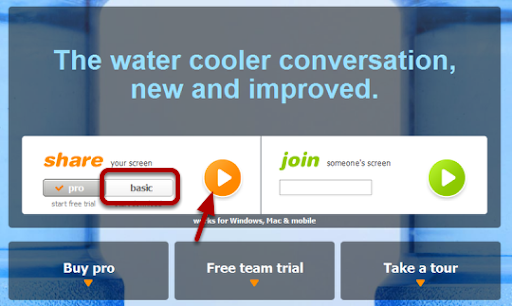 Then click the orange arrow. To be able to share your desktop you need to run the Join.me application, this is a one time install. Click run. 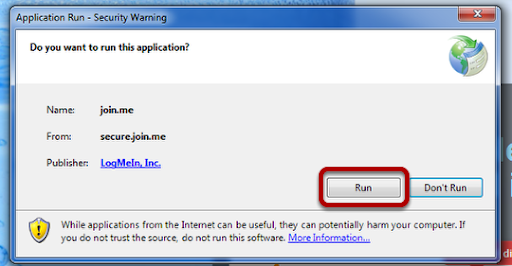 The Join.me application will now install. 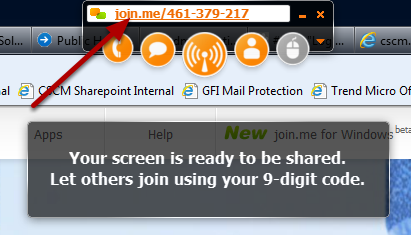 Contact the person you want to share with and ask them to visit https://join.me and enter your 9 digit code into the Join section and then click the green arrow. You will now see a message to say the other person has joined, they can now see your desktop but they cannot interact with you until you give them permission. Click on the Person icon and below a small window opens, click on the icon of the mouse and you can share your desktop with the visitor. You have now given the visitor access to your desktop and then are able to move your mouse and interact. Choose yes to disconnect the visitor. 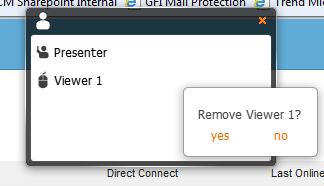 Finally to close your session, click on the X to close the application and remember to remove the check for keeping Join.me on the desktop. 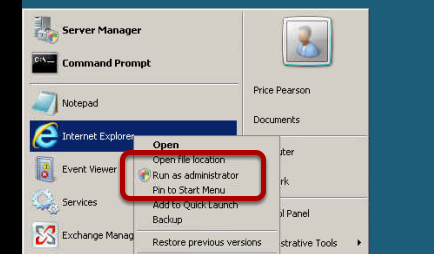 A user cannot logon to a Windows 2008 R2 Server, other users may be connected and be able to reconnect. 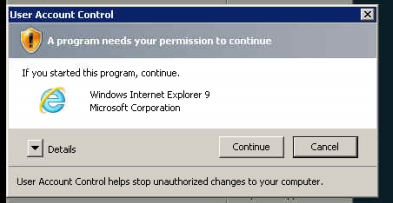 This issue is recorded in a Microsoft KB Article http://support.microsoft.com/kb/2661332 and it is caused by an issue with Csrss.exe and Microsoft Excel or Visio. There is a hotfix for this issue, request and install the hotfix. I did this while the server was in production, not best practice but I had little choice as my customer would not tolerate a reboot at that time. To enable the hotfix I restarted the Remote Desktop Services Service, often this is all the reboot does when it is requested. A quick Powershell that is worth sharing is this command to display the number of mailboxes per database. 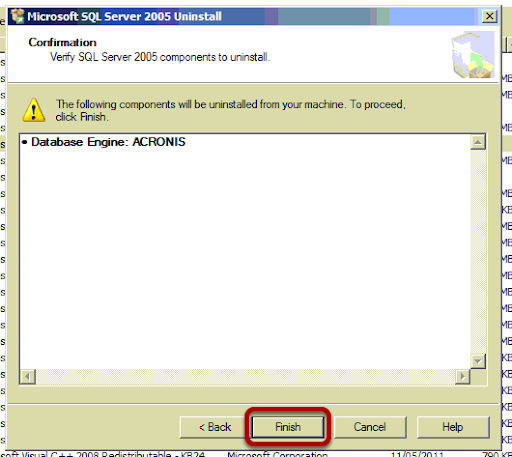 When Acronis Backup & Recovery is uninstalled the application does not remove the MSDE SQL Server 2005 Express database so you have to remove this manually. Why is this important? 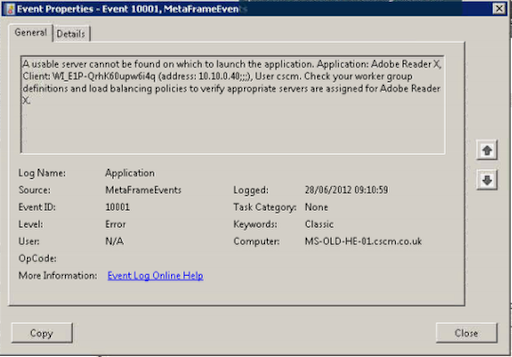 This MSDE instance will take up disk space and CPU cycles running for no purpose as you have removed the application it served. 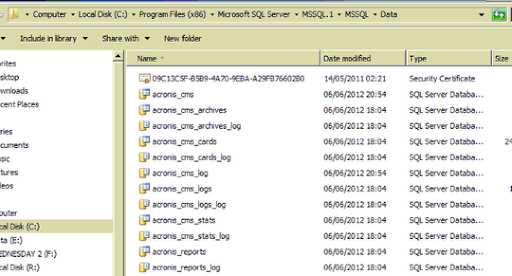 The files here are the database files used by Acronis CMS and that are taking up disk space on our server. 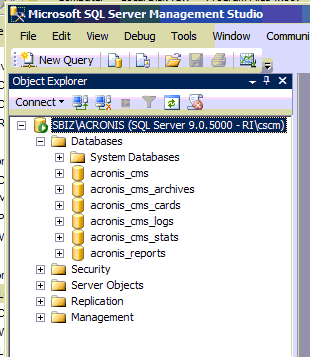 If you run the SQL Server Studio Management you can see the instance we are referring to SBIZ\ACRONIS in this case. 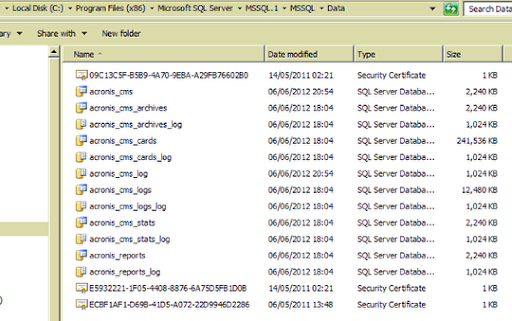 Here are the SQL Server database files attached and online even though we have removed the Acronis application. 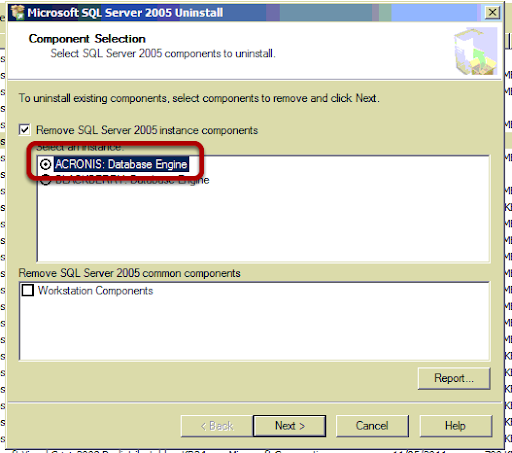 Acronis uses SQL Server Express 2005 so choose Uninstall for this application. Select the instance for ACRONIS. Click Finish to confirm the uninstall. In the Services MMC stop the service. You may see a further error, this can be more difficult to work out what needs to be closed. The number shown is the Process ID or PID, this is the process that has a handle on the file we want to remove. 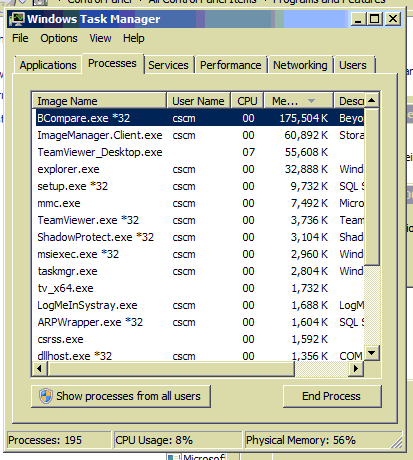 To find the Process open Task Manager. From the menu, choose View, Select Columns. If the process is not running under your user context you will need to show process for all users. Here you can see the PID that we need, 3860. 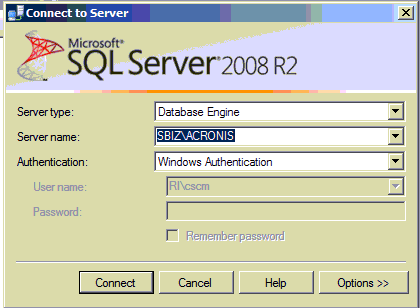 This is an instance of sqlserver.exe, although we closed the instance for ACRONIS there are still other instances running. 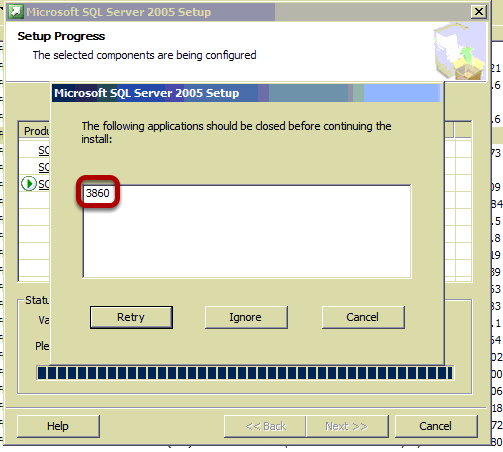 Stop the service for all other instances of SQL Server running. Restart the instance you stopped before. 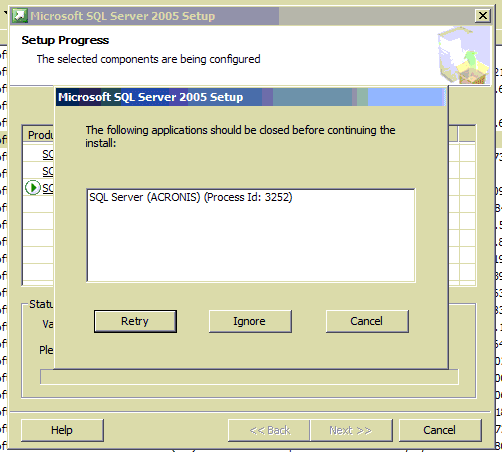 Note that the service for SQL Server (ACRONIS) is now gone. Delete manually the database files. You are now safe to delete the database files. If you have a IPoE connection which will use a bridged connection on your DSL circuit and you have a Cisco IOS router then use this guide from Cisco to help debug your connection. How to rate limit the bandwidth for an outbound conection through an ASA 5510. The Cisco ASA 5510 will allow for control over the bandwidth and burst rate allowed through an interface, the config below will show how you can control outbound bandwidth through the outside interface. First create an access list that will match the interesting traffic, in this case the IP address 10.10.0.40 represents the internal server on our network used for testing. Next a class map is required to match the traffic we want in our policy map, if you have used Zone Based Firewall before then this will make sense. The class map matches the access list we have created. Now we need to create a service policy, this will match the class map. This is the Cisco way of nesting objects, it is logical but can be confusing sometimes. 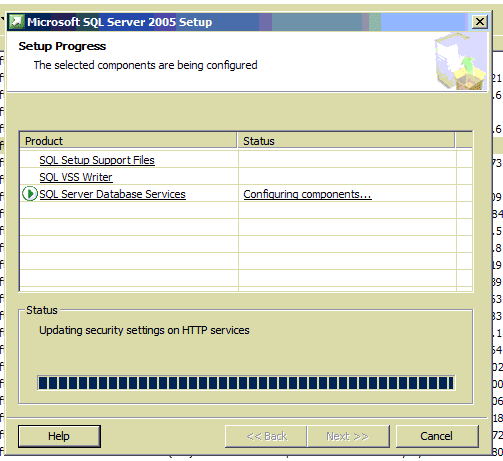 Last we create a service policy and this is assigned to an interface. In this case this will inspect all traffic in both directions through our Internet facing interface but because we are using PAT we can match only on traffic to and from our internal IP address and so allow all other IP addresses utilise as much bandwidth as they need. As part of my recovery of a Sharepoint Server in vSphere, I decided once the server was all restored that I would take a Data Recovery Backup, but when I attempted this I received the error. 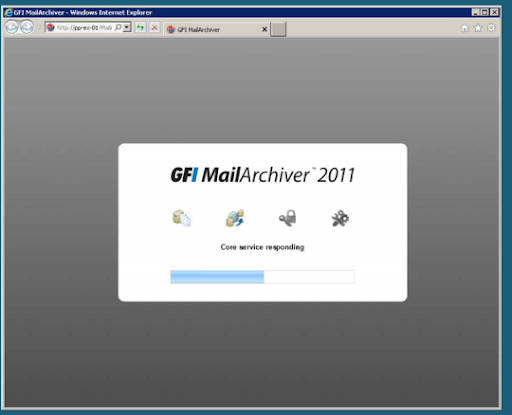 Snapshots all involve the VMFS and are related to all the files in the datastores for each virtual machine. Now you have to be really careful with these files as they are the workings of each virtual machine, but you can if you are careful manipulate these to resolve problems. In my case this article from Vmware resolved my problem. I had a -delta.vmdk file that was orphaned and not linked to my vmdk files so I downloaded the virtual machine vmx file and checked that this -delta.vmdk file was not referenced and then moved the file to a backup folder in vmfs. Once this orphaned file was removed I could run a Data Recovery backup and take a snap shot again. Distributed File System - Error "the share must be removed from the distributed file system before it can be deleted"
If you are trying to remove a share and you receive the error "he share must be removed from the distributed file system before it can be deleted" when you try to remove this, you need to remove the share from DFS. If you cannot access DFS any longer and this is an orphaned share you can remove it manually from the registry. Edit the registry and browse to HKLM\Software\Microsoft\Dfs\Roots\Domain and then look for the share name and delete the registry key.